So much of the work of an international college counselor involves understanding different systems: what do you need to provide, at what time, in which format. One of the most enjoyable aspects of my job is standing at a school’s careers or university event, answering questions about university entrance around the world, with no prior warning which country I might be talking about. Sometimes I’m asked questions where I just have to tell students that what they want isn’t possible, for example wanting a rugby scholarship to New Zealand or undergraduate medicine in the USA. There are so many things which just aren’t possible: the system says no. However, on three occasions in this application cycle I’ve had situations where the system said no, and I knew that the system was wrong. Faced with these situations, what should one do? In these situations I feel lucky to be independent: the only person I am beholden to is me. I have the luxury to perhaps challenge or poke the system, to see if changes can be made. I’m also very fortunate to be a member of the International Association for College Admission Counseling and an affiliated consultant to the Council of International Schools, meaning that I am a known member of the global admissions community, not someone sitting in an office in London who might know the system but has few relationships beyond this. The first time I knew that the system needed challenging came in August 2018. 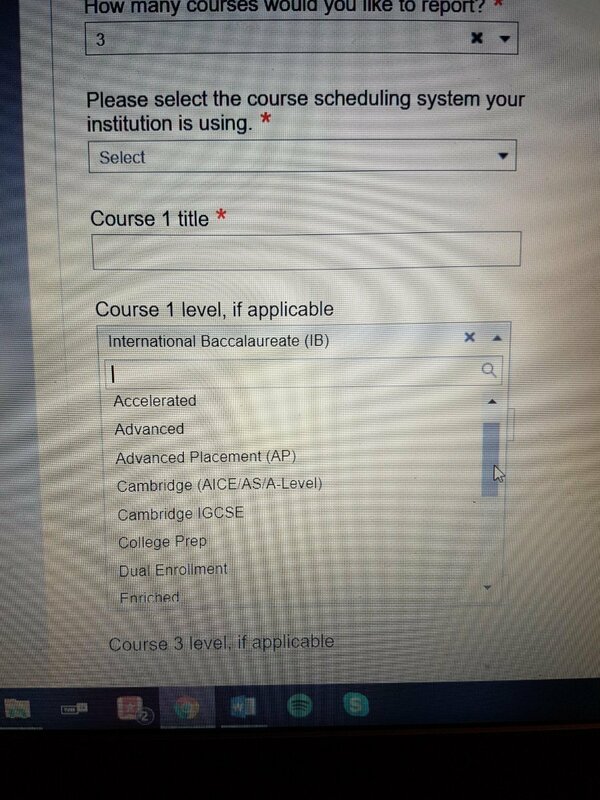 I was in Delhi, India, for the IC3 Conference, when one of my students emailed me very confused about which curriculum option to choose for the US Common Application. She couldn’t find ‘A Levels’ listed anywhere. Logging into my trial account, I saw the problem: the Common App had replaced the word ‘A Levels’ with ‘Cambridge’, a common way that A Levels are described in the US but one not that familiar beyond North America. A second need to change the system took slightly more time, and involved a student of mine who I knew was an ideal match for an international university in Spain. However, this student was taking a combination of BTEC and an A Level, something which, to that point, this university had not been able to accept for admission. The temptation might have been to leave things be, but knowing a number of key people at this university, and their holistic approach to admissions, as well as them knowing me and the calibre of students who I have supported with applications to them before, meant that I thought a change could be made, with my student as a test case. With the student’s parents happy to proceed, I set off to convince the university to change its admissions policies. A few phone calls, emails, many discussions with various staff and a highly convivial dinner and taxi ride with the Director of Admissions in Vienna later, I was assured that my student would be considered on his merits and not just labelled as a ‘BTEC student’ - a few months later he heard that he was admitted and will join them this September. The third situation involved standardized testing, and a student who needed to take the ACT with extra time, for use for entry to some private European universities. With no space left to test with extra time in the UK, this student flew to Germany to take the test, only to find (partway through the test), that the ACT had sent the wrong test through to his computer workstation and he did not have extra time. Nothing could be done there and then, and the students and his parents were deeply worried. Through my contacts at ACT I was able to arrange for a special paper to be flown overnight to the UK, where the student’s school opened especially (in the Christmas holidays) for him to take the test. Then, with the hard deadline for his university in Italy approaching quickly, I advocated for an accelerated marking process (to speed up the 6-week turnaround typical for paper-based ACT with extra time), with the student receiving his ACT score just hours before he had to have it. Thankfully it was a good score, and the student was admitted to his top-choice university in Italy. So often in the world of university advising, we look at the systems and fall back on them: it simply can’t be done. But the inspiring story of how 60 students from Nepal were saved from an admissions tragedy shows us how when we see that something can be changed for the better, we need to step in. I am proud to have done my bit this year, opening the door for the students at the core of our work to have new avenues to success.